After our Gibraltar Tour, we traveled inland to Granada for our Alhambra Tour.The snow capped peaks of the Sierra Nevada mountains were barely visible due to the extreme heat of the day.Temperatures reached more than 95 F during our visit.The trees were producing lots of polle, so many tourists were coughing and sneezing. 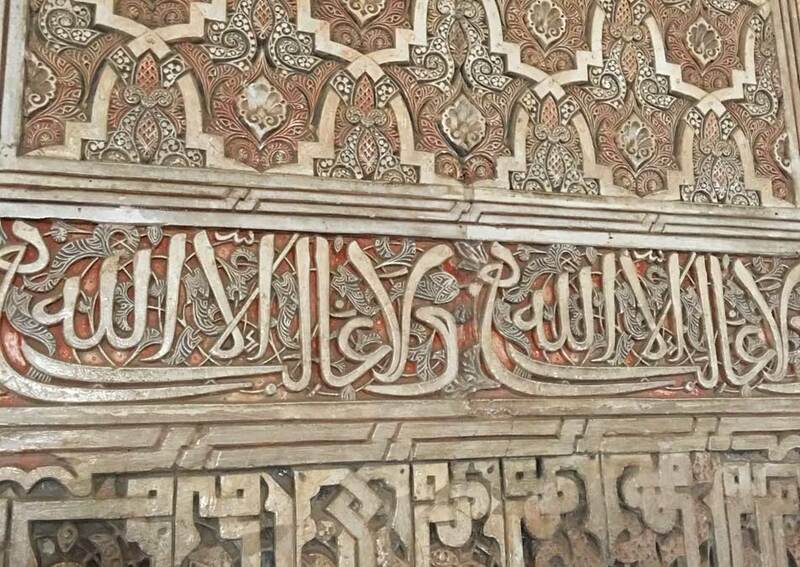 Our tour of the Alhambra took several hours.We saw all the major things to see, such as the Generalife gardens, the Court of Myrtles, the Court of Lions and the Palace of Charles the Fifth. The Moorish calligraphy and designs were intricate and widespread throughout the complex. 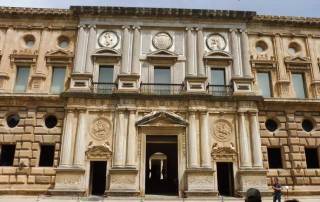 The variety of architecture and gardens seemed endless. 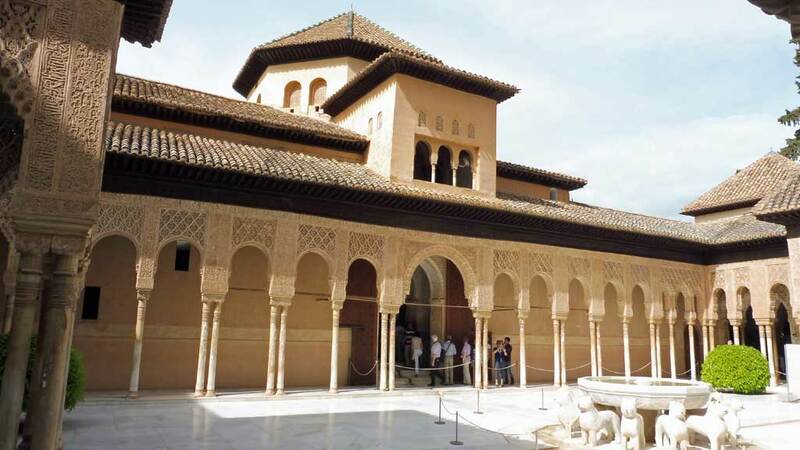 The palaces and patios kept coming to the point that was kind of confusing. 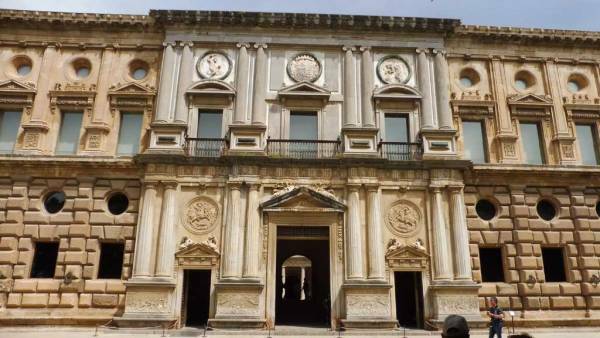 The next sight motivated you to keep moving around each garden, palace and courtyard. 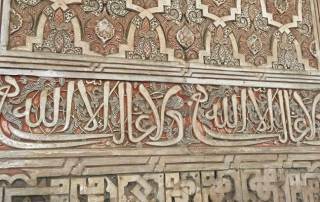 The Alhambra has an interesting history. 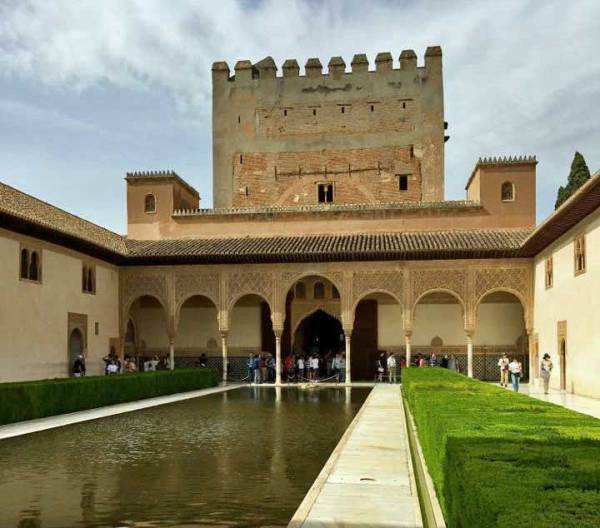 The fortification and grounds were the summer residence for Moorish royalty. 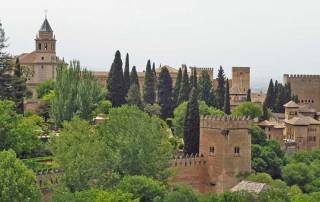 In 1492 Ferdinand and Isabella of Spain seized the Alhambra. 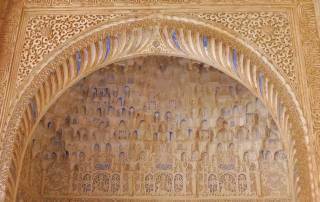 The Moors were forced to convert to Christianity or leave. 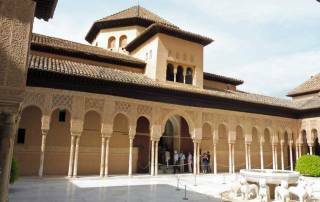 In that same year, Christopher Columbus visited the Alhambra to receive official endorsement of his voyage from Ferdinand and Isabella. To me, the Alhambra is an over-rated experience. The palaces and gardens are repetitive. The crowds cause long delays, since access is controlled in many areas. Clearly, most people don’t share this opinion. 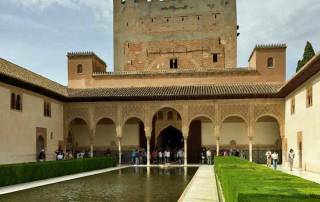 For many years the Alhambra was the number one tourist attraction in Spain. Only in the last few years was it surpassed by the Sagrada Familia in Barcelona. The Alhambra still ranks as the #2 attraction for visitors to Spain. The rapid paced tour that Gate 1 Travel provides can make you run out of energy before you see everything. 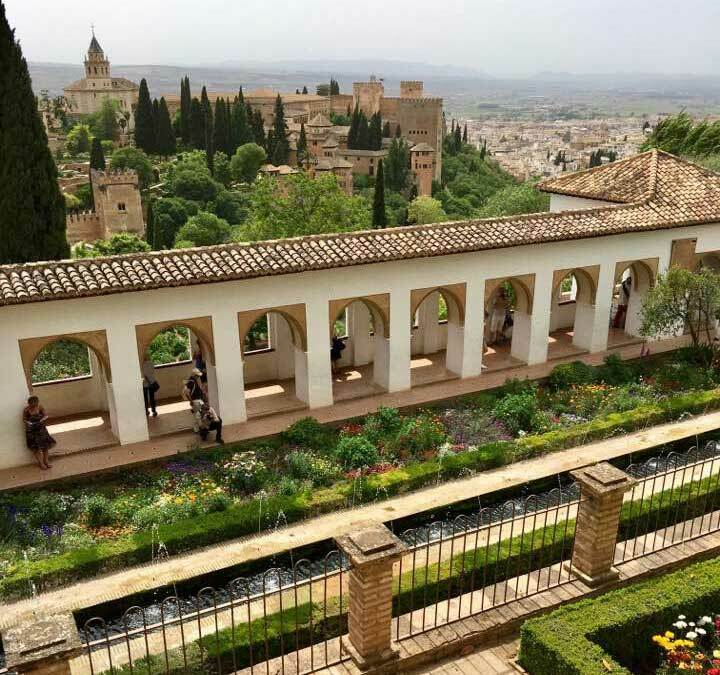 After the bus trip to Granada, the tour of the Alhambra and the dinner provided by Gate 1, most of us were too tired to see more. 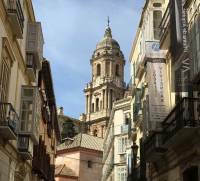 Only 2 people on the tour found the energy to cab to Mirador San Nicolas. 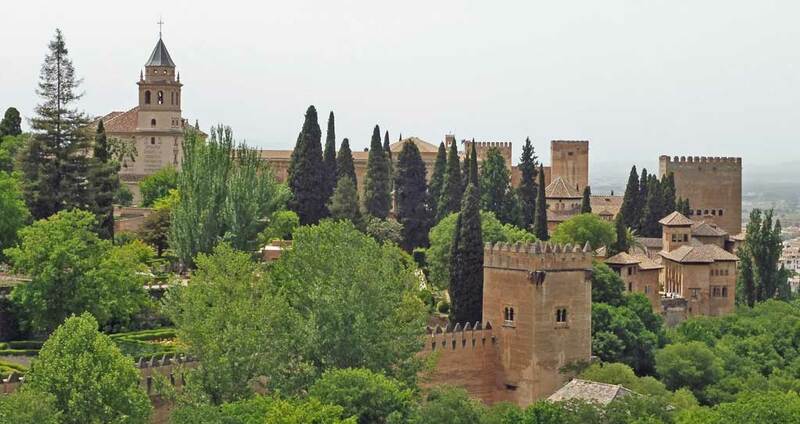 The San Nicolas viewpoint is across a ravine from the site of the Alhambra. 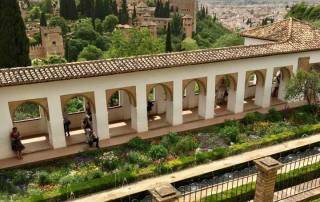 Photographers choose this location, because it provides the best view possible of the Alhambra. 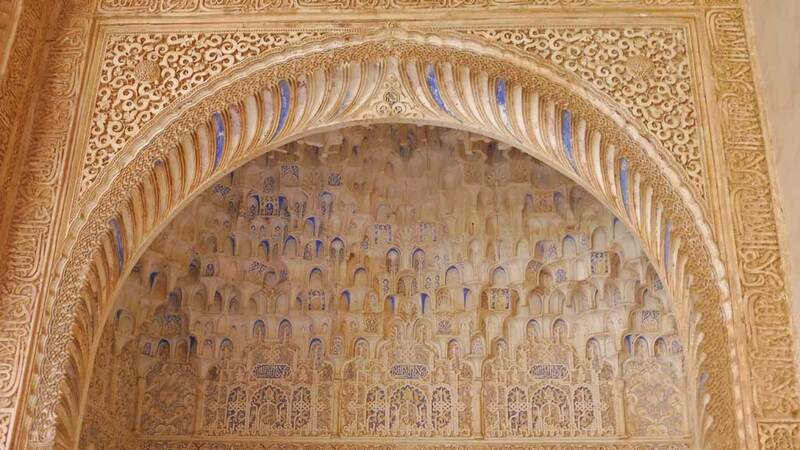 The travel and Alhambra Tour made me too tired to take advantage of the viewpoint.